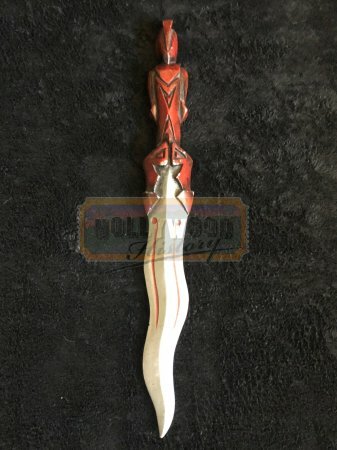 Gabrielle's Dagger [XWPGD] - $350.00 : Hollywood History Online, Discover the Magic and Bring Hollywood Home! Xena travels to Britannia to assist her former ally Boadicea in her rebellion against Caesar. Gabrielle travels with her and makes a new friend Khrafstar who tells her about his one god, however Gabrielle doesn't know that this journey will change her life forever. 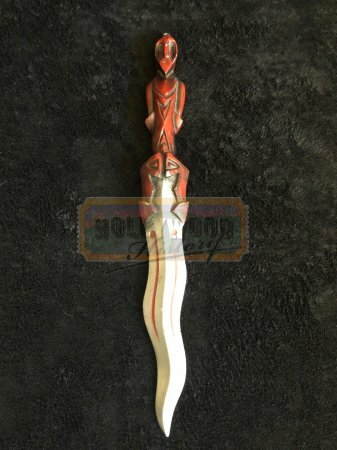 From the TV series Xena: Warrior Princess this is a Dagger used by Gabrielle (Renee O’Connor) in the 1994 season 3, episode 4 “The Deliverer”. This dagger is made of resin and has an ornate figure for the handle. The dagger is seen when Gabrielle manages to free herself during the sacrifice but in order to save Krafstar, she winds up killing Meridian with the dagger.